Last month, I posted some images of our local starling murmuration. I popped back three times last week and was delighted to find them still there, doing their thing, only in greater numbers. Yesterday was the best yet as the sunset kindly provided a colourful backdrop. This entry was posted in nature, photography and tagged Boldermere, landscape, landscape photography, murmuration, nature, nature photography, photography, starlings, Surrey by Rachael. Bookmark the permalink. The pictures are, as always, gorgeous . . .
. . . would this kind of show lend itself to time-lapse animation? Thanks! Maybe, but probably a straight video would be better as they move so fast. Time lapse is usually better for slow things? I think? Not something I’ve tried, yet. 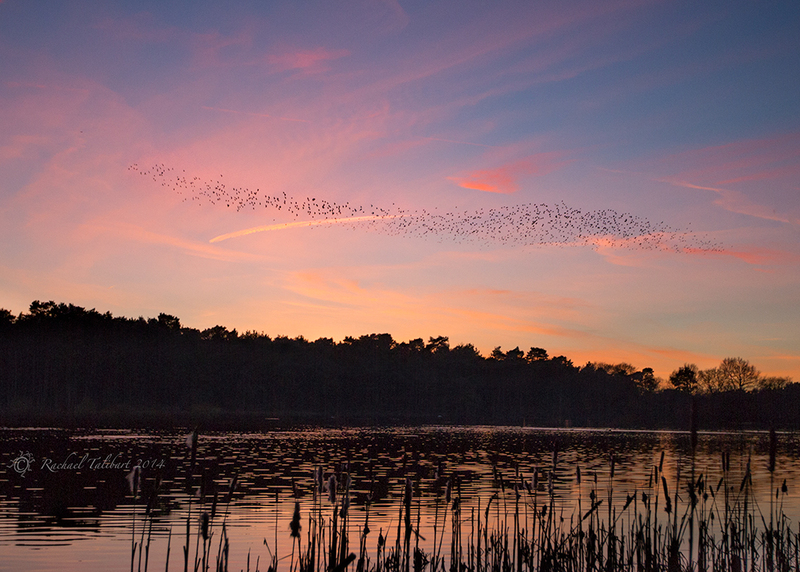 The murmuration lasts 15-20 minutes, and it is always at dusk. You can set your watch by it. I’ve been down there five times now and never get tired of it. Love your still shots of it, though! The reason I mention timelapse is that I have decent luck with taking 10-15 shots as fast tas the camera can shoot, and then generate a looping GIF (a la my galloping horses (about halfway down – http://bit.ly/17ul0jU). The other reason I mention GIFs is that I don’t usually bother with a tripod, and shooting a movie hand-held generates less-than-optimal results. If you have a pro-camera, you can usually get 20-30 shots before the buffer fills, and more if one is shooting JPGs. That would make for a reasonably long GIF animation. Just beautiful! You inspired me to get out and take some nature photos! Great shots. At our local place as well as having murmerations of starlings we also saw knots doing the same thing. (only instead of disapearing into the reeds they kept it up for at least an hour over the shoreline. Yes, knots are great value. But is it a murmuration? You describe it as such on your blog. But is the term is reserved for starlings? Genuine question, I don’t know. Love the sunset colours, and what a great discovery to find a display like this on your doorstep! Amazing capture! Really beautiful. The sunset colours and reflections in the water are the icing on the cake. And a belated Happy New Year! Always fascinating to see that behavior – and you captured it so nicely! I’m not the first to say it, but it’s true… These photographs are beautiful, as are so many of you images. I’m a fan! Thank you! What a lovely comment.